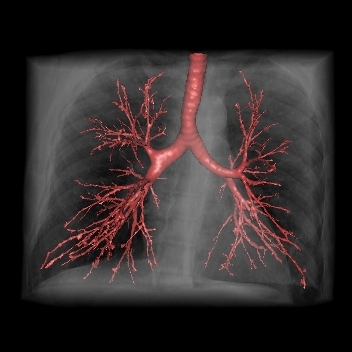 The Airways project aims at developing advanced facilities for physio-pathological analysis of pulmonary airways in Multi-Detector Computed Tomography (MDCT). The challenging issue is to exploit the three dimensional anatomical information contained in MDCT data in order to automatically segment, represent and explore the airway structure. Computer-assisted diagnosis, preoperative investigation in virtual endoscopy and assessment of bronchus morphology changes under various stimuli are some of the clinical applications covered by this project.